describing the endless flow of bigeye jacks we saw. Dive Journal: Under dark skies, we take a bumpy boat ride south today again to the Cabo Pulmo Marine Reserve, but fortunately we are rewarded with warmer waters, good visibility and a pleasant current. This site is near El Bajo (dive #218) and Los Morros means “the noses,” I guess referring to small hills. At first we see big friendly yellowtail surgeonfish that make stunning video. Then we enter an area Linda dubs “Balloonia,” the mythical place where all balloons go. 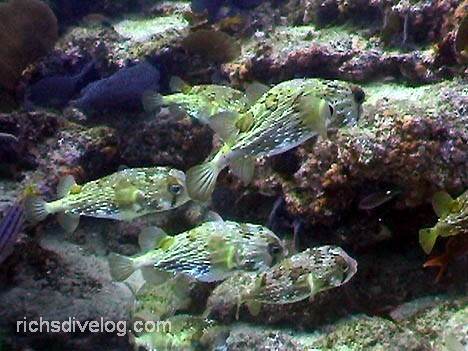 There are several dozen balloonfish seemingly arranged in an array over a large patch of sea floor, hovering several feet off the bottom. It's possible this is a nesting grounds. We swim around and circle through these fish for quite a while. As we drift along, we come across a big grouper getting cleaned, and stop to examine him for while. I also find several bulls-eye skates and an interestingly shaped ray and take some video until Ash suggests I’d better move away (from the ray). 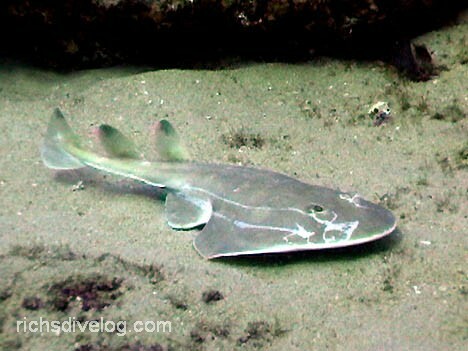 Ash may have thought it a lesser electric ray, but from later identification I'm thinking this might be a shovelnose guitarfish (below). Comments from readers? Drifting further still, we finally come across a HUGE HUGE school of big eye jacks! They are descending from the surface in a superhighway of traffic, and the flow seems endless. There is a monsterous school of them on the surface, with a big river of them diving down to the reef, probably to cleaning stations. I keep the video rolling for many minutes, capturing this activity from many angles and magnifications. The sight of so many jacks in one place, and so close, is just outstanding. This dive is over too soon, but even the safety stop is fun as we careen through the ultra-blue waters in the current. 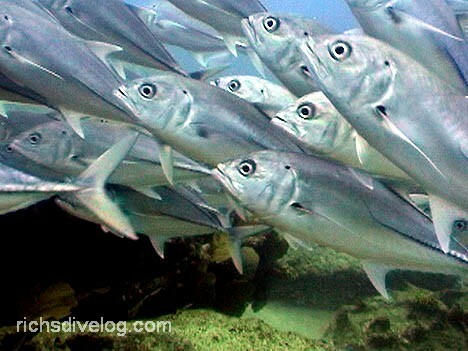 Superb dive – highlighted by the jacks.